Elvis Grbac was born August 13, 1970 in Cleveland, Ohio to parents Ivan and Cecilija Grbac who have immigrated to the United States from Croatia in 1967, just 3 years prior. Grbac grew up in Willoughby Hills and attended St. Joseph High School, where he played basketball and football. St. Joe’s famously has produced some of the greatest athletes to come out of a single high school in Northeast Ohio including Clark Kellogg, Bob Golic, Mike Golic, London Fletcher, and Elvis’ high school and future college teammate and receiver, Desmond Howard. Grbac was recruited by the University of Michigan as part of their 1988 recruiting class, which Bleacher Report recently named one of Michigan’s greatest recruiting classes of all time. This 1988 class entered under Michigan coaching legend, Bo Schembechler, who was succeed by Coach Gary Moeller when Schembechler retired at the completion of their 1989 season. Starting a few games in the 1989 season, Grbac officially took over as the starting quarterback in 1990 where he led the Wolverines to a co-Big Ten Championship that year. The passing chemistry between Grbac and high school teammate, Desmond Howard, was undeniable. Grbac was the quarterback for Howard’s Heisman Trophy season in 1991, culminating in what later became known as “The Catch” – the unforgettable fourth-down pump fake and 25-yard touchdown pass to Howard to clinch a 24-14 win over Notre Dame. In interviews reflecting on that career-defining moment, Howard is repeatedly quoted saying “timing is everything,” giving credit to the chemistry between the passer-receiver duo. Grbac completed 20-of-22 passes in that game, a record against Notre Dame opponent. 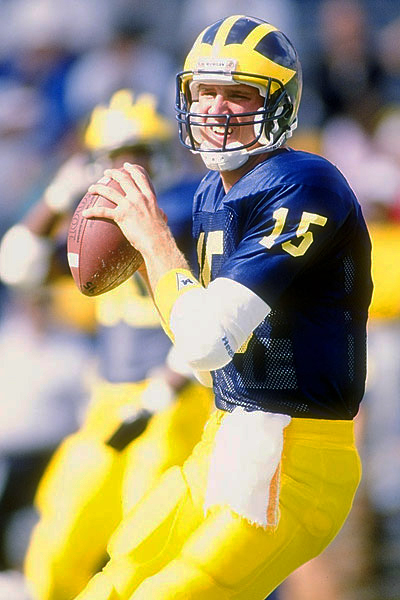 During his career at Michigan, Grbac swept the four meetings with rival Ohio State, won four Big Ten titles, and led the Wolverines to a Gator Bowl victory in 1991 and three Rose Bowls in 1990, 1992, and 1993. He ended his career at Michigan a three-time passing efficiency champion, a Sammy Baugh Trophy winner for leading college QB, and the school’s all-time leader in passing attempts, completions, passing yards and passing touchdowns. Grbac graduated from the University of Michigan in 1993 with a B.A. in Communications. Following a successful college career, Elvis Grbac entered in 1993 NFL Draft and was selected in the eighth round by the San Francisco 49ers. During his 1994 rookie season, the 49ers won Super Bowl XXIX with 49-26 victory over the San Diego Chargers. Grbac served as backup quarterback to Steve Young from 1994-1996, appearing in 42 games with the 49ers and 9 of which he was the starting quarterback. Grbac averaged a 89.0 QB rating during his time with the San Francisco 49ers. In 1997, Grbac signed with the Kansas City Chiefs as their starting quarterback and led them to their fourth AFC West Division championship in that 1998 season. Grbac played with the Chiefs for four seasons, ending on a high note in the 2000 where he passed for 4,169 yards and 28 touchdowns with a passer rating of 89.9, and was named to the 2001 Pro Bowl. Grbac signed with the Baltimore Ravens in 2001 before opting for an early retirement at the end of that season. In total, Elvis played 9 seasons in the NFL, starting 69 of the 106 games he played for San Francisco (1994-96), Kansas City (1997-2000) and Baltimore (2001). With 9 years in the NFL under his belt, Elvis moved the family back to Northeast Ohio to settle down in Chagrin Falls where he currently lives with his wife and high school sweetheart, Lori, and their three children, Jack, Calvin and Ella. In 2007, Elvis was inducted into the Greater Cleveland Sports Hall of Fame, an organization that honors athletes who have brought recognition to Northeast Ohio through their outstanding athletic performance and accomplishments. Elvis got back into the game in 2010, this time serving as the quarterbacks coach for the St. Ignatius High School football program in Cleveland, Ohio. Under his coaching and guidance, the St. Ignatius Wildcats varsity football team won an Ohio state championship in 2011. Inspired to share his life story and continue coaching beyond football, Elvis has become very involved in the Catholic community in Northeast Ohio. He serves on the pastoral council at the Church of the Holy Angels in Chagrin Falls and is involved in teaching Youth Catechesis. Elvis is also currently pursuing a Master’s degree in Theology at St. Mary’s Seminary. Elvis Grbac is a member of the Catholic Speakers Organization, CatholicSpeakers.com.